Just that the Venice book by Jiro Taniguchi, this one's also part of the Louis Vuitton Travel Book series. 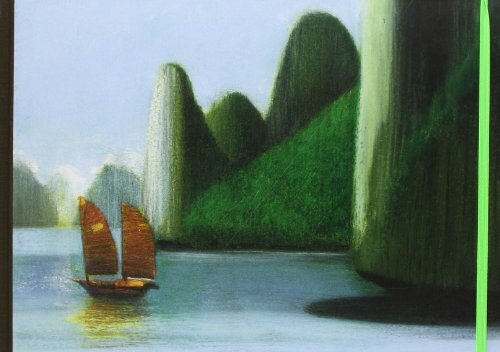 This volume features Italian artist Lorenzo Mattotti and his impressions of Vietnam. This is a 168-page hardcover about A4 size. The page edges are trimmed to a lime green, corners are rounded, and the cover comes with a rubber band to hold the covers together. Paper is matte. This book feels more like a travelogue sketchbook because of the style and the subjects drawn. You'll see a lot of artworks of people going about their daily chores, setting up shop, sleeping in their stores that sell textiles and hats, farming, and working. The different places are also beautifully drawn and really makes me feel like traveling there. The locations included are Hanoi, North (Halong Bay, Ninh Binh, Bac Ninh), Center (Hue, Hai Van, My Son, Hoi An) and the South (Saigon, Mekong). Lorenzo Mattotti uses a variety of drawing media, coloured pencils, charcoal pencil, watercolour, pastels, brushes and also different types of paper. The artwork feels very lively because of the switching media. The coloured pencils and pastels artworks are really beautiful and captures the mood and colours really well. It's a pricy book. There's also a limited edition of 50 boxed, leather-bound copies are available at selected Louis Vuitton stores. I love the art style. Great book. Highly recommended.